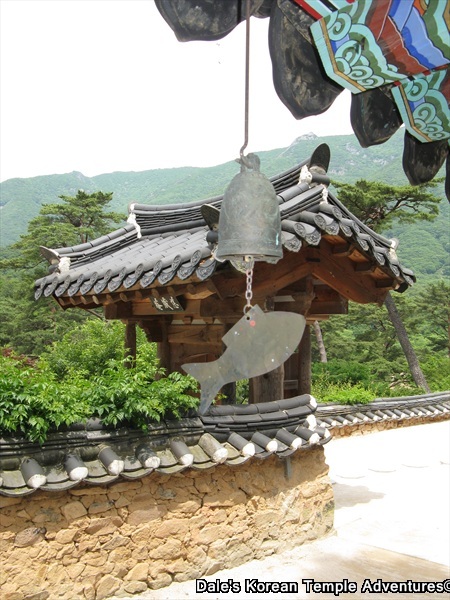 A fine example of a fish-shaped wind chime from Gakwonsa Temple. One of the most beautiful decorative devices adorning a Korean Buddhist Temple are the melodious wind chimes that hang from the eave's of shrine halls. And while these bronze wind chimes are absolutely beautiful, like everything at a Korean Buddhist temple, they have a special meaning. So what do they look like? And why do they adorn Korean Buddhist temple halls. 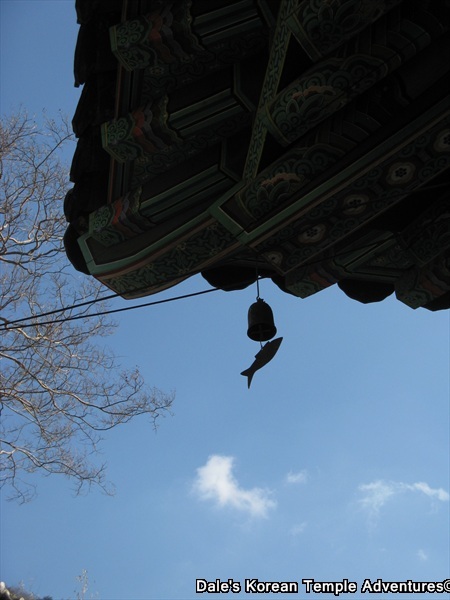 With a clear blue sky overhead, the fish-shaped wind chime blows in the breeze at Pyochungsa Temple. When you first approach a temple, especially on a windy day, you'll be able to hear a slight ringing in the air. And if you look up at the eaves of temple shrine halls, you'll see the source of this beautiful music. Uniquely, a bronze fish clapper is attached to the bell. So why exactly is the wind chime shaped like a fish? First, the wind that passes through the chime is likened to the condition of complete freedom from obstruction, which is highly symbolic of the goal for all Buddhists. Secondly, a fish's eyes always remain open when asleep or awake. Similarly, the chimes ring day or night without end and without ever getting tired. This act is a symbolic reminder to monks to always remain diligent and alert on their path inside the Dharma. A third and final reason is that when the bell sounds it dispells evil spirits. As a side note, that's why a lot of houses have these fish wind chimes near the entrance of their homes. An up-close look at a fish-shaped wind chime from Jajangam Hermitage. 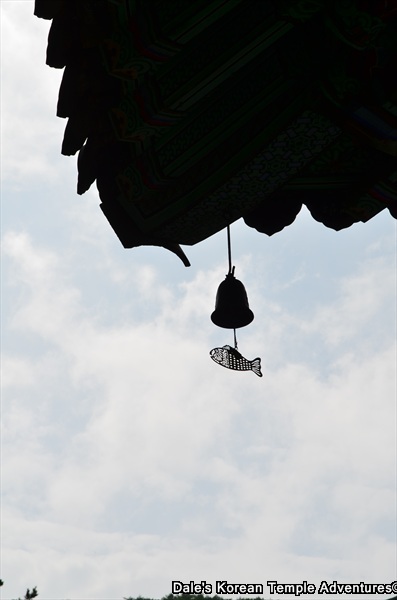 With an overcast sky overhead, the fish-shaped wind chime never rests at Beomeosa Temple. 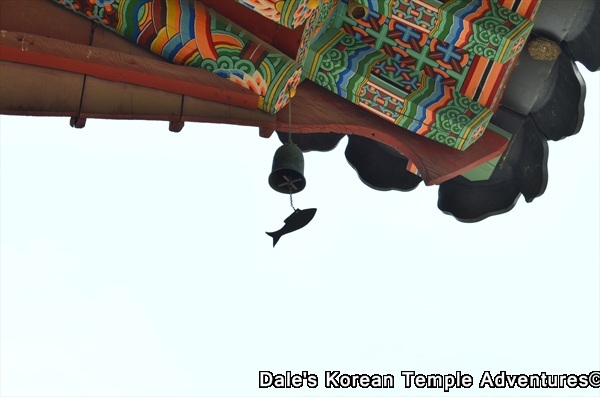 Much like all artwork that adorns Korean Buddhist temple halls, the fish-shaped wind chime has so much more symbolic meaning than simply looking and sounding beautiful. So the next time you hear a ringing in your ear at a temple, you'll know that this sound is a reminder to the faithful to remain ever diligent in their belief and the vanquishing of evil spirits. 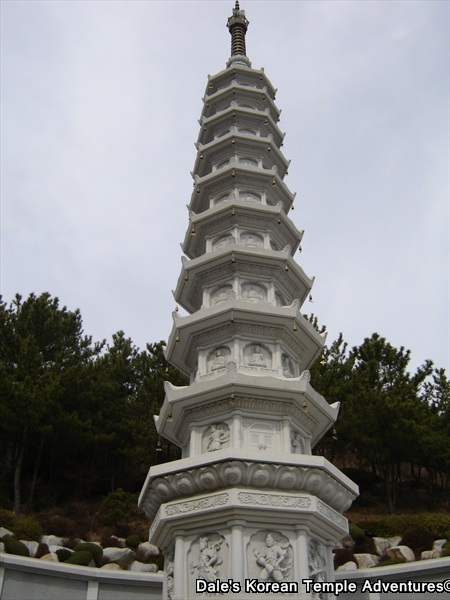 Nearly a hundred fish-shaped wind chimes adorn the gorgeous granite pagoda at Samgwangsa Temple.